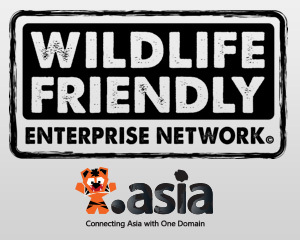 Hong Kong – 20 Jan 2016 – DotAsia Organisation, who operates the global “.Asia” Top-Level Domain (TLD) as a not-for-profit organization with a mandate to promote internet development and adoption in Asia, and the Wildlife Friendly Enterprise Network (WFEN), a global community dedicated to protecting wildlife in wild places and on private agricultural lands in between, are pleased to announce an exciting new collaboration to raise awareness about the important role of internet companies in the poaching crisis and the trade in illegal wildlife parts online. Using Tigers as the flagship species, this effort will assist companies to take positive, productive, practical and achievable steps to address this crisis which could lead to tragic consequences for highly endangered species like Tigers. This effort will also promote legal and certified Tiger Friendly™ products and services that will empower global companies and their consumers to create change on-the-ground and support Tiger conservation and improved livelihoods for rural communities who often turn to illegal activities like poaching to feed their families in Asia.